Westchester County Executive George Latimer activated the Emergency Operations Center in Hawthorne at 8 a.m., to coordinate the County’s response to the major winter storm that is expected to bring a significant snowfall on Saturday into Sunday, followed by freezing temperatures on Monday. Latimer urged County residents to take precautions for the weather event, which may bring downed trees and powerlines, power outages, coastal flooding and dangerous travel conditions. Under Latimer’s direction, County personnel assigned to the EOC will monitor storm preparations and oversee the County’s response and recovery. The County will be ready to assist municipalities with resources if requested, he said. The County’s Department of Emergency Services and Health Department offer practical advice to help residents prepare for a major winter storm and stay safe both during and after. Please visit http://keepingsafe.westchestergov.com and www.westchestergov.com/health for more information. Have plenty of batteries on hand for flashlights and battery-powered radios. Keep them where you can find them easily if the power goes out at night. Keep cell phones and other important electronic devices fully charged. Turn the freezer and refrigerator to the highest setting. This will preserve food longer if the power goes out. Assemble a three-day supply of water and non-perishable foods, needed medications and extra clothing and blankets. Have a go-bag ready in case you must leave your home. Do not walk or drive close to snow plows; it is difficult for plow operators to see you. Do not go near, or drive over, downed power lines. Always follow the manufacturer’s instructions when using alternate heating sources like space heaters and wood burning stoves. Do not place a space heater within three feet of anything that may catch on fire, such as drapes, furniture or bedding, on top of furniture or near water, and never cover your space heater. Never leave children or pets unattended near a space heater, fireplace or wood burning stove. Call the local utility company to inform it of the power outage. Con Edison’s 24-hour hotline is 1-800-75-CONED (752-6633) and NYSEG's hotline service is 1-800-572-1131. Leave a light on to let you know when power has been restored. Use flashlights or battery-operated lanterns instead of candles, as candles are a fire hazard. Limit opening refrigerator and freezer doors as much as possible. Do not operate electrical generators indoors, (this includes the garage) as it could lead to carbon monoxide poisoning. Only use them outside in a well-ventilated area, far away and downwind from your home. If you use a fireplace, wood stove or portable kerosene heater to stay warm, be sure to adequately ventilate to the outside to avoid carbon monoxide build up in your home. Never use a natural gas or propane stove to heat your home. Never use the stove or gas range in your kitchen to heat your home. Dress warmly in windproof clothing to prevent frostbite and hypothermia. Wear several layers of loose-fitting clothing to trap body heat. Remember gloves, scarves and a hat that covers the ears. 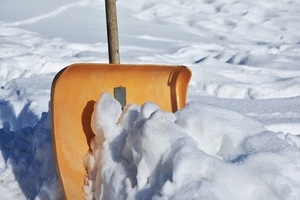 Shovel snow in moderation, particularly if you have any medical condition or you do not exercise regularly. Clear snow off the roof of your car to avoid creating a hazard for other drivers. Do not shovel snow from driveways and sidewalks into the street. Never start or operate a snow blower or chain saw in your garage. Clear the area around hydrants near your property, if possible. Before driving, clear snow from vehicle windows and roofs. Be on the lookout for falling ice and snow from roofs and gutters. When a lot of heavy snow and ice has accumulated on roofs, do not stand under structures that are not well-supported. During a prolonged power outage, these foods are potentially hazardous if not stored below 41 degrees Fahrenheit and should be discarded: meat, poultry, seafood, cold cuts, hot dogs, eggs, cream, sour cream, yogurt, milk, custards, puddings, soft and shredded cheeses, cut fruit, cooked vegetables, pasta, casseroles, unbaked cookie and bread dough, gravy, creamy salad dressings, fish sauces, hoisin sauce, opened spaghetti sauce and garlic in oil. Remember, when in doubt, throw it out.